The Dead is a new zombie film which is receiving a limited theatrical release this month. 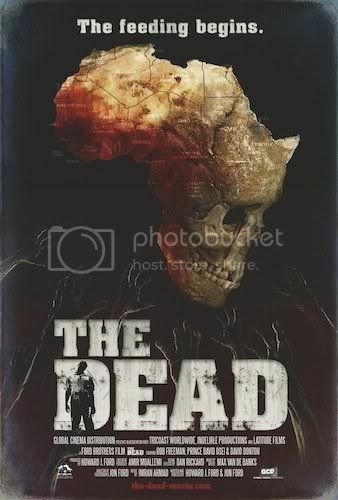 Released by Global Cinema Distribution, this gut wrencher has been getting rave reviews for its use of terrifying, slow moving zombies and its dangerous African locations. Directed by Howard J. Ford and Jonathan Ford, this one is poised to be a cult classic. The Dead stars Rob Freeman (Saving Private Ryan) as Army Lieutenant Brian Murphy who crash lands off the coast of Africa. He barely makes it to shore, but once he does, he has to make his way through a swarm of flesh eating zombies. He eventually meets up with an African Army Officer named Sgt. Dembele (Prince David Oseia), who is searching for his young son. They attempt to make it to the closest airport in hopes of finding a salvageable plane (Murphy is a engineer who fixes Army vehicles). But they must also avoid being bitten by the zombies that have begun to take over the world. The Dead succeeds on many levels. First is the Zombie FX. There is a nice mix of practical and CGI FX that blend well together and look pretty realistic (and very nasty). You will see severed limbs, nasty bites, bullets to the face and different states of decomposing dead. Another aspect of the film that brings it a step above your typical zombie movie is the beautifully shot exotic locations. Filmed on location in Africa, we see everything from the stunning shorelines to the lush forests to the barren deserts and the impoverished villages. Though the story is pretty simple and the film moves along at a leisurely pace, what you are a left with is a very respectable addition to the over crowded zombie genre. One other tiny gripe is that some of the acting seems a tad amateur but overall, this is definitely worth a watch (and better than most zombie films coming out now). Check HERE for upcoming screenings.